POSTED Mon, 05/25/2015 - 16:00 | POSTED BY Traci C.
If you've ever dreamed about spending one night inside the Cinderella Castle Suite at the Magic Kingdom, you might get to see your dream come true thanks to a new contest. Disney recently announced the Coolest Summer Ever Disney Side contest with a grand prize of an overnight stay in the castle. POSTED Wed, 04/22/2015 - 16:00 | POSTED BY Traci C.
Spring is in full swing at the Walt Disney World Resort and there are a couple special events happening between now and the start of summer vacation season, including the 2015 Star Wars Weekends at Disney's Hollywood Studios. POSTED Tue, 12/30/2014 - 16:00 | POSTED BY Traci C.
Even if you can't be in the Magic Kingdom on New Year's Eve to ring in 2015 with tens of thousands of other guests, you can still be part of the magic from the comfort of your living room. The Disney Parks Blog will be live streaming the New Year's Eve presentation of 'Fantasy in the Sky' fireworks. POSTED Tue, 10/28/2014 - 05:00 | POSTED BY Traci C.
Minnie Mouse and her spirit team made a visit to the ESPN Wide World of Sports Complex to inspire cheer and dance squads around the country to show their Disney Side in the nationwide Cheer Your Disney Side campaign. POSTED Wed, 09/17/2014 - 05:00 | POSTED BY Traci C.
Recently the Magic Kingdom hosted 101 dogs at the first-ever Disney Side Dog's Day. This special event was held early in the morning on August 30 and had been announced a few days earlier on the Disney Parks Blog. Attendees were invited to the event based on their entries to the Disney Side Dog's Day contest. POSTED Sat, 08/09/2014 - 05:00 | POSTED BY Traci C.
Humans aren't the only ones showing their Disney Side this year. Animal Planet's popular television series America's Cutest has launched a nationwide search for pet owners and their furry friends who want to show their Disney Side for a "Howl-O-Ween Pet-acular" special. 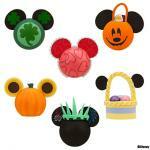 POSTED Mon, 07/28/2014 - 05:00 | POSTED BY Traci C.
From seasonal antenna toppers to entire "stick families" in Mickey Mouse ears, there are many options when it comes to adding a Disney touch to your car. We've compiled a list of some of our favorite car accessories.